The Charisma Media Network Presents…. I have teamed up with the Charisma Media Network to bring you the chance to win a healthy and tasty assortment of freeze dried fruit snacks! One very lucky winner will receive 14- one ounce bags of freeze dried fruit by Funky Monkey! 2 bags of each fantastic flavor! Funky Monkey offers a delicious and healthy way to enjoy fruit, it is perfect for on the go snacking or as an addition to hot or cold cereal! Enter to win via the rafflecopter form below for your chance to win! 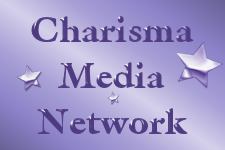 Did you know that the Charisma Media Network is seeking bloggers? Please visit us at http://www.charismamedianetwork.com/ to learn more!